Home / غير مصنف / Storm Diana Met Office update: Where is Diana now? Will it hit YOU? Storm Diana Met Office update: Where is Diana now? Will it hit YOU? Met Office forecasts are pointing towards high wind and rain in the coming week, starting from November 26. While many have been noticing a small rise in temperatures from freezing into mild, the associated low pressure is expected to bring with it some rain and wind. There will be a marked effect on driving conditions, especially as the last of the cold weather leaves fog and frost, making for difficult visibility and slippery roads. The low pressure is expected to combine with the growing threat of incoming storm Diana, about to swamp the Portuguese Azores islands. Storm Diana is still some way off the UK at the moment, just stirring around the Portuguese Azores islands in the Atlantic. The Archipelago is set to receive the bad weather come Tuesday, and from then on power towards the UK, where winds could exceed 70mph. BBC Weather forecaster Matt Taylor revealed both gale force winds and heavy, persistent rain will tear through the UK this week. He said: “Milder air will come between Tuesday night and Wednesday wrapped around a deeper area of low pressure. “A windier area of low pressure, heaviest of rain on Wednesday will be to the west and this is where we see the strongest of the winds. 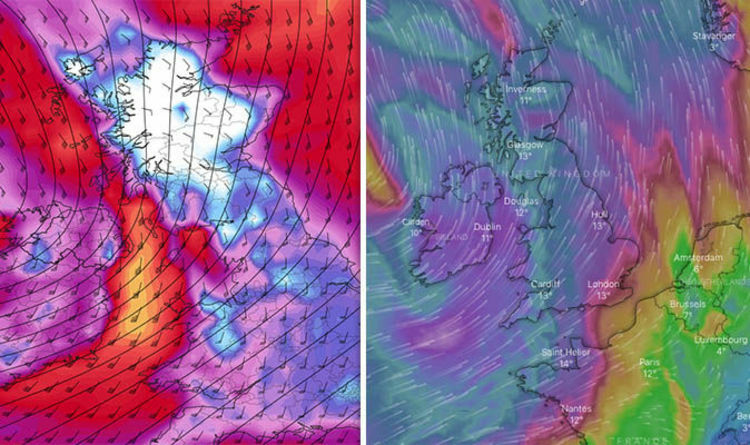 “Winds 55-65mph, maybe 70mph or more across the north-west of Scotland. The Met Office has mirrored these forecasts, but has clarified timing on Wednesday is as of yet uncertain. Dan Harris, Met Office Deputy Chief Meteorologist said: “It now looks very likely that we will see a major change in the UK’s weather early in the week ahead. “We expect spells of wet and windy weather to sweep across the UK from the southwest from Tuesday, although at the moment there is uncertainty around the timing and the focus for the heaviest rain and strong winds by Wednesday as Storm Diana approaches our shores. Where will storm Diana hit? Storm Diana’s power will be focussed mainly in the north, where high winds will settle around 70mph, encroaching on gale force. In the centre and south of the country, Diana will batter with winds from 40-50mph, resulting in treacherous travel conditions. Ireland will receive the brunt of the storm as Diana moves in from the west, with the north and south both receiving 55-65mph winds. Forecasters predict there will be few regions in the UK where rain will not fall.